Cross stitch pattern from Plum Street Samplers. May I present to you Mrs. Crow, with a beautiful gold crown, standing proudly on a beehive with buzzing bees! Gorgeous quilt motif flowers are blooming behind her. 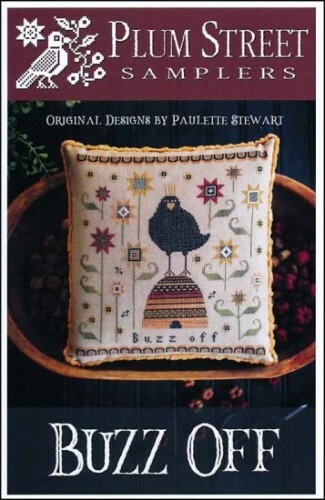 Now "Buzz Off," I have stitching to do! Stitched on R&R Reproductions 36ct. Vintage Beeswax. Stitch count 137w x 148h. Trim used: Lady Dot Creates Jack Cotton Chenille.